When 26.2 isn’t enough – Ultrarunning around D.C.
You probably know an ultrarunner, and not just the ones you read about in Born to Run. The sport has grown significantly in recent years as more marathoners ask what’s beyond 26.2 miles. In D.C., ultrarunners hide in plain sight, working for the government, opening donut shops, or practicing law. They infiltrate your road marathons, casually enjoying a bagel while you’re trying to stomach another gel. They’re your colleagues, your neighbors, your friends. And if you’ve been thinking about taking on these more extreme distances and conditions, they’re your best resource for getting into the sport. 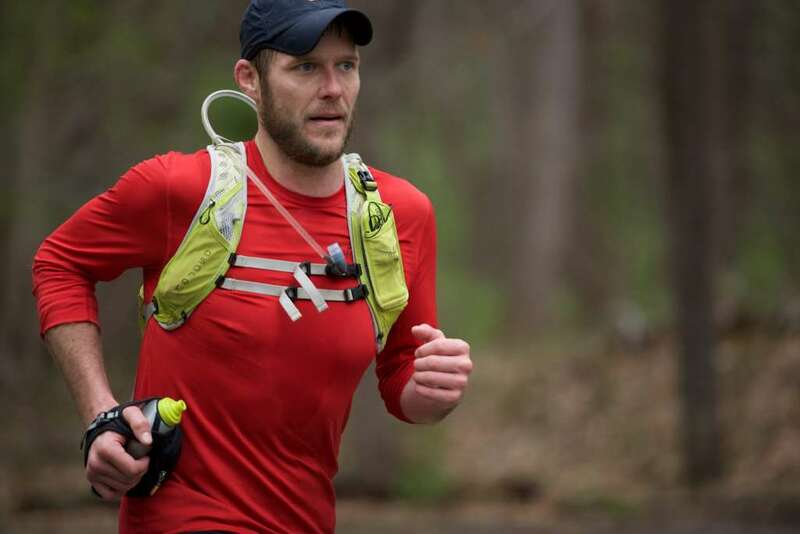 With some 635 members, 20 events, and three major races per year, the Virginia Happy Trails Running Club is the hub of ultrarunning in the D.C. region. “We’ve been here right from the start, sort of being a driving force to have events and runs that appeal to everybody,” said club president Alan Gowan. The club has grown in the last few years as younger runners join the sport, and the club has adjusted to fit members’ interests. That includes partnering with the D.C. Capital Striders on a weekly trail run in Great Falls Park. Striders President Rick Amernick has come to admire ultrarunners’ tendency to mentor one another. Lauren Masterson, president of the Washington Running Club, came out to Great Falls while training for her first 50 miler this year. She turned to ultrarunning as a way to stress less about her road marathon times, but she still felt timid before her first run. In April, at the finish line of VHTRC’s Bull Run Run 50-mile race, runners rounded the final turn, greeted by the clatter of a cowbell. Kids toddled alongside their fathers to the finish, where race director Alisa Springman greeted them with a high five, handshake, or hug. Volunteers tugged perforated timing stubs off of race bibs and handed out t-shirts. Two-liter bottles of soda lined a picnic table in the finisher’s chute, but the good grub was up a hill in the Chow Hall, where members of VHTRC dished out chili, brewed coffee and shot the breeze. For 350 runners, she recruited a team of 150 volunteers to support the race in rain and even an unseasonal burst of snow. Like many others, she called the community “tight-knit” and “family.” In a race like the Bull Run Run, she relies on volunteers to make the event run smoothly, but she also relies on the runners to watch out for one another. “You don’t have to spend weeks and months and days and years with a person on the trail to get to know them very well,” she noted. “Oftentimes, an hour or two on the trail where you’re really open and connected to things emotionally, you share a lot more and you feel much more connected than you would otherwise.” This isn’t just talk for her, either; Springman and her husband met at a trail race. “It took off from there!” she said. Most people don’t think of major urban areas when they imagine trail or ultrarunning, but the D.C. region does not lack for training routes. In Rock Creek Park, more than 30 miles of paved and unpaved trails wind between commercial and residential neighborhoods of Northwest D.C. Great Falls has another 15 miles in Virginia, and across the river, the C&O Canal Towpath runs past miles of detours on its way to Cumberland. In a relatively short drive, you can reach the Shenandoah or Massanutten mountains, Harper’s Ferry or parts of Pennsylvania. “You would never know that there’s opportunity for trail running here,” said Larry Huffman, who found VHTRC in early 2010 and ran a 50k within the year. Huffman lives in Tyson’s Corner, the rapidly urbanizing suburb just two miles from Great Falls. He runs to the Wednesday night workouts. Although our mountains are a bit less majestic than the west coast’s, decorated marathoner and ultrarunner Michael Wardian sees a lot of upsides to living here. Wardian has been known to train with his treadmill at its maximum incline to prepare for races out west, although he regrets that he can’t mimic the brutal descents that follow those climbs. Like many of us, he stays here to be close to friends and family and the D.C. food scene. When he travels for races, which he does often, he can choose from three airports and virtually every carrier, making his trips more flexible and cost-effective. His friends in Montana don’t have that luxury. “I feel like it’s worth that kind of tradeoff to be able to get all the perks that we have living in a place like this,” he said. Wardian has raced around the world and has seen a lot of terrain, but he settled pretty quickly on the destination most like home: Costa Rica, where in 2014, he won the 225k Coastal Challenge Expedition race through the rainforest. “The climbs aren’t super big and the trails are super duper similar to the U.S. […] That was really neat. I felt really comfortable on those trails,” he said. Most notably, the climate is “kind of like our summer heat. It’s like soupy, hot, humid, which is great for me but a lot of other people from different climates like the Northwest or West Coast kind of suffered. That was something that made me feel at home.” Endlessly optimistic, Wardian has found an upside to some of the worst traits of D.C.’s weather. VHTRC member Josh Howe of Chantilly gushed about the Instagram photos of a friend who recently moved to Colorado, but he has no plans to leave just yet. Even if an ultramarathon doesn’t spark your sense of adventure, ultrarunners generally agree that thinking or training like them can make a difference at shorter distances thanks to the improved endurance, nutrition habits and mental toughness that come from their training regimens. Ultrarunners also develop an ability to eat real food on the run and a highly articulated sense of their nutritional needs. When Josh Lasky started training for his first ultra, he would buy a Chipotle burrito and try to eat it during the workout. “Bit by bit, bite by bite,” he said, “you take that burrito down.” With his stomach acclimated, he can sustain himself on slow-burning whole foods for most of his races, then get a boost from sugar and caffeine to power him to the finish. If you do decide to take it on, ultrarunning can shake up everything you know about yourself as a runner. “Whatever you run on the roads really doesn’t matter,” Masterson said. Between technical skills, extreme conditions, and the sheer duration of the event, ultrarunning requires a totally new approach to training and racing. You cannot go fast and gut it out. Your GPS probably won’t work; even if it does, your mile splits will be at the whim of the next hill. Your supplies will disappear, your headlamp will die, or your feet will blister; something will go wrong despite your best planning. You will feel soaring highs and profound lows and you will learn to eat when you start crying. If you’re capable, you will keep going, pushing on to find out what physical or emotional boundary you can crack next. This is not a sport people do for fun in the moment; if anything, they do it to feel the pain, to endure it, and to find out who they are on the other side of it. Lasky has a philosophical take that he’s mulled over the course of many miles. “I think the reason why ultrarunners do what they do is because they don’t have the ability to imagine it and they’re not satisfied with the imagination alone…” he said. “It requires a willingness to come face to face with your own mortality, your own limitations, your own strength.” Lasky took up the sport after several years caring for his disabled father as well as a lengthy recovery from a broken ankle. For him, ultrarunning is a test of his limitations and a display of gratitude for his own mobility. Best of Washington Running nominations!